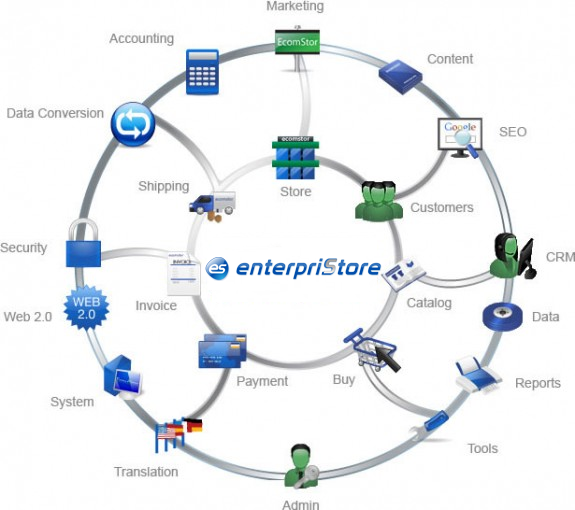 Ecomstor SEO & Interrpristor are 4th generation web based osCommerce Ecommerce software webware programs. Seven (7) years of programming to enhance the osCommerce 2.2 platform. Convert osCommerce compatible sites in One (1) day. Easy & affordable ways to purchase lease and host our unlimited use solutions. Category and product faceted guided navigations allow your customer to refine their selection of products to be viewed by choosing product attributes they want to view. Faceted Search provides a framework to focus on desired products by removing the undesired products from their view. Focus is then ONLY desired products. Each choose provide fewer and fewer products meeting the search criteria of the Customer and enables the Customer to find what they want based on criteria that is important to their search. Variable thresholds for each product or manufacturer or customer type. Shows other related products in related categories to provide other buying ideas. Collections – When a Specific Manufacturer has collections within their brand – we will place a link to those. Get a quick estimate of shipping costs. Email Cart and Save Cart to My Account. Process and Order as New Account or Guest. Each Different Ship From Location has a possible two (2) different listing depending if it is shipped via Ups and an LTL Carrier. Listing of items in the Shipment and a Pull down to select the shipping option you desire. When there are multiple locations where a product may be fulfilled from – we can designate the shipper based on Zip codes. Click Box – I have read the Terms & Conditions and I agree to them. Unlike a PHP or ASP page which sits in a database until the page is called to display, we create a hybrid page. It is both a HTML static page and dynamic page; it is always up and it acts like a dynamic page after clicking on it. Every page has a static page that can be submitted to the search engines with meta tags, keywords, word clouds, etc. This is the same technology as Amazon.com, the largest e-commerce site in the world. Control the background, colors, fonts, graphic look-and-feel for the entire site. Upload graphics from your desktop or from the image folder of your online server. Create your own header and footer menu with links to pages you desire. Each Category can have a special look and feel. Each vendor can have multiple â€œShip Fromâ€ addresses and use different shipping methods. their orders for 3 months in advance. In the EcomStor administration area by using Create Order or Create Quote. Quotes can be processed into orders when ready. Send a quote with freight in seconds. No calling and waiting for freight quotes. Youâ€™ll get the same prices you get over the phone – faster. Use templates to create multiple types of quotes. Use the Administration area to create an order and process directly through the Web site. Distributors are given a special login where they see only their products and pricing. Easy-to-use Shopping List makes pre-orders and ordering quick to accomplish. Calculates Volume of Boxes of Smaller Items and Makes a New Box when filled up. Shipping Exclusion Zones – Setup a group of Zip Code that you will not ship to. Sell one product from multiple â€œship fromâ€ addresses. Our program finds the closest product with the cheapest freight. Each vendor can sell different products and use many different shipping methods. Vendor/manufacturer can sell from multiple locations – even if each location has a unique set of products in addition to some of the same products. Customer may choose a product sold at many different locations. Our program will determine the closest manufacturing facility with the product on hand (to minimize freight charges). If a customer buys three products, and all come from different manufacturing locations, the customer will get three invoices with freight based on three different locations. Customers can have their own freight company. They can then choose between vendor-supplied freight or arranging their own freight. If the dimensional weight of a group of products is over 150, then an automatic lookup is enabled that will give both a parcel price and an LTL price. Customer chooses a product sold at 4 different locationsâ€”our program will determine which manufacturing faculty has the product at the least amount of freight. Customer buys 3 products and all come from different manufacturing locations â€“ the customer will get 3 invoices with freight based on 3 different locations. Each major customer can have his own freight company. Choice of vendor-supplied freight or buyer arranges his own freight. If the dimensional weight of a group of products is over 150, an automatic lookup is enabled that will give both a parcel price and an LTL price. Each product from each â€œShip Toâ€ location can have a specialized shipping method. Each major customer or distributor can have unique shipping methods. Sell products from multiple vendors. The order is taken by the Web site, then routed (via email) to the selling vendor who fulfills the order and ships. The order and the freight costs are calculated automatically and payment is made via the Internet. You fulfill the order, print the labels and ship. Get instant quote for shipping (same as what you are getting now manually) and process the order. Send invoice to customer and fulfillment order to manufacturing. It takes just a few minutes per transaction compared to hours, perhaps days, to do it the old way. Already have a site? You can add more features, expand your horizons, add other programs that will compliment your existing site. It will cost you less to buy this program than continue what you are doing now. Spend your money on increased efficiency or lose more than the cost of this product on labor intensive practices. RSS / Web 2.0 Ready. Program Data API allows you to customize your import and export of data for any tables in the database In XML, CSV, Tab Delimited or Pipe. This facilitates easy connection to your accounting, supply chain, ERP programs with delayed or real-time data integration. Penetration â€“ 91% of the world markets. Donâ€™t get rid of your current site – Improve it, add more features, everything is a mouse click away. Create another site ( branch office) with a different name and different look and feel. Have A Content Site ? Easily Integrate With Blogs, Social Networks, Wiki, Forums, CRM. Have an e-commerce site? Quickly add other features.